Demographic groups can’t affect elections if they won’t turn out and vote. In the main, Young people, Black people and Hispanic people don’t bother voting in the USA, in the main. Nothing will change until they bother. If they aren’t as mad as hell yet and itching to vote out the Trumplican Party across the board, then I don’t know what will ever motivate them. It’s pretty sad for them and for the still (relatively) free world. The other two superpowers are totalitarian states, with no history of democracy ever, so there’s next to no hope there. The world situation looks very grim. The USA is failing, declining and falling apart. Meanwhile, climate change and limits to growth are closing in on the world. It seems to me to be helpful to distinguish between ‘generation games’ applied to economic variables and those applied to political categories. The problem with assuming that the now young Democrats will rule when the now old Republicans die is that people get more conservative when they get older. Or in Australian terms, today’s 2GB-listening, Sky News-watching and Australian-reading Liberal voters supported Gough Whitlam and the early Bob Hawke, horrified that their parents supported Malcolm Fraser. The Republicans get more support from Hispanics than you might think. While they tend to be poor, they are also tend to be socially conservative. Yes, Roman Catholicism has a lot to answer for as do the other monotheistic sects and religions. They all fill people’s minds with arrant and dangerous nonsense. Religious faith equals blind belief in dogma. Not one significant thing asserted by the monotheistic religions about the natural world has been found to be correct. All of the central assertions of religion are conveniently (for religious authorities) un-testable by any empirical means. The consistent stance of all the monotheistic regions has been to deny basic reality, deny science, deny democracy and deny equal human rights. Their consistent operation has been to promote hatred, intolerance, cruelty and war. Its hard to believe so many young people in the US dont vote . Even those form disadvantaged minority groups see no point. I think its a testament to years of Neo-Liberal style cultural engineering by stealth under the name of ‘economics’ – markets as a force of nature, faith only in oneself . Its a huge achievement to have redefined human nature so quickly and couldnt have been done without bipartisan support . Trump is desperately straying into overt cultural engineering ,its best done more slowly and by stealth. Among other things ,destruction of the union movement has helped to remove peoples faith in collective action . Shut up and shop ! Apart from generations – Democrats won the womens vote by a landslide. 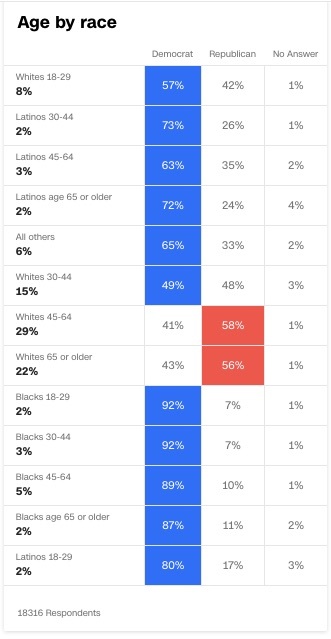 The difference in Republican support between White 18-29 age group to White 65 or older is mere 14%. The biggest differentiating factor is actually race instead of age. Which shows Trump is very effective in his (or the Republican’s) strategy to divide the nation by race. This means that race demographic will play a more important role in US future elections compared to age demographic. Tom is right. Sorry Prof Q but this really is the poorest post I’ve seen on this blog. I recall Mark Bahnisch triumphantly saying in the late or mid 2000s that there could never be a resurrection of Pauline Hanson’s political career because the oldies who voted for her were dead or dying. That struck me at the time as a nonsense point; a large chunk of moderate and Left voters swing Right when they get old just as sure night follows day. And sure enough, when the theory was put to the test the bleedingly obvious happened and Pauline got re-elected along with a swag of PHON candidates. The younger white cohorts in America will invariably swing to the Right as they age although what the Right is in 40 year’s time will be a bit different from what it is today just like today’s Right is a bit different from what it was in 1978. Please leave the generation game to the beads and sandals crowd, Prof Quiggin. Previous comments here seem to imply that various groups eg blacks, young, don’t vote because they can’t be bothered. The facts are that for many of those groups it’s very difficult to vote and this has been the status quo for a long time. They really need to address this issue in its entirety before the country can claim that all it’s citizens are treated equally under law. There are battles everywhere against those seen to be working to suppress minority groups from voting. One such person is Brian Kemp and it’s a neck to neck race against challenger Stacey Adams. Another character big on voter suppression is Kris Kobach, who just lost his bid for Governor of Kansas to a democrat. It has been reported that he was so confident of winning that he had his staff do a walk through of the Governors office. In this particular case Kobach represented himself which brings to mind the old saw that he had a fool for a client. Interesting. I can’t find many Australian poll’s online, that breakdown voters by ages. The one linked below is from 2013 and demonstrates that age is a determining factor for voting intention. I believe it to be true as the political parties as far as I am concerned have been playing inter-generational games for a long period, and increasingly so. For example the means tests for the “dole” versus aged pension is pure idiocy imo.